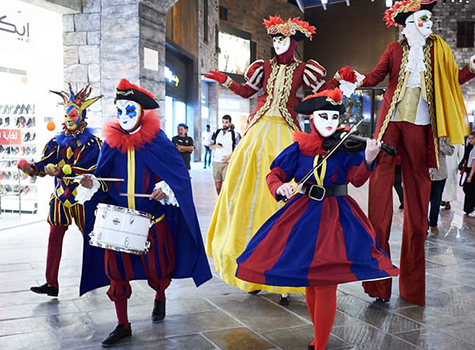 The Outlet Village has more than designer bargains up its sleeve this Dubai Summer Surprises with a host of onsite live entertainment options to add even more value to your seasonal shopping experience from 18-21 July. Classical music with a hilarious twist comes to life courtesy of the UK’s Comedy String Quartet with a Vaudevillian performance that spans multiple musical genres and styles while the fantasy flowers experience is a visual delight. A pop-up market presents even more shopping opportunities and there’s a good chance you’ll get to meet Modhesh in the (blue and yellow) flesh with daily appearances and photo opps. Dubai Culture brings emerging artists to the village for live painting demonstrations with an Italian theme, and the Toys activation zone is a must-see for little ones with Professor Slime sharing his secret formula to make your own ooey gooey pot of slime. If you’re looking to expand your summer wardrobe then watch out for exceptional daily deals and spend and win for a chance to enjoy a shopping spree or luxury staycation.